A week ago, I was in a beachfront palapa in Tarara alongside Eduardo Pimentel, the godfather of Cuban yoga. "Thank you for coming here to Cuba," he said with a big smile to our group of American yoga practicioners. "You are brave and you coming here teaches me. I learn from you as much as you hopefully will learn from me." He taught us an Iyengar inspired practice and made jokes as he quickly won over our group. We learned, we laughed, we loved. We connected. There was so much to love in Cuba. There is so much to love in Cuba. Over the six days we were there, we danced on rooftops, shared cigars with locals, rolled around in antique convertibles listening to Justin Bieber (true story), drank tons of cafecitos, explored back alleys of Havana, learned how to salsa dance, ate delicious food and fell hard for the immense beauty and personality of the island. So how'd this all happen? I grew up to a family of wanderlusters - my mom and dad took off to China when I was three years old, so I'm always thinking about travel. About a year ago, I really wanted to visit Cuba and figured some other people would want to go too. And hell, why don't we all do some yoga while we're there. 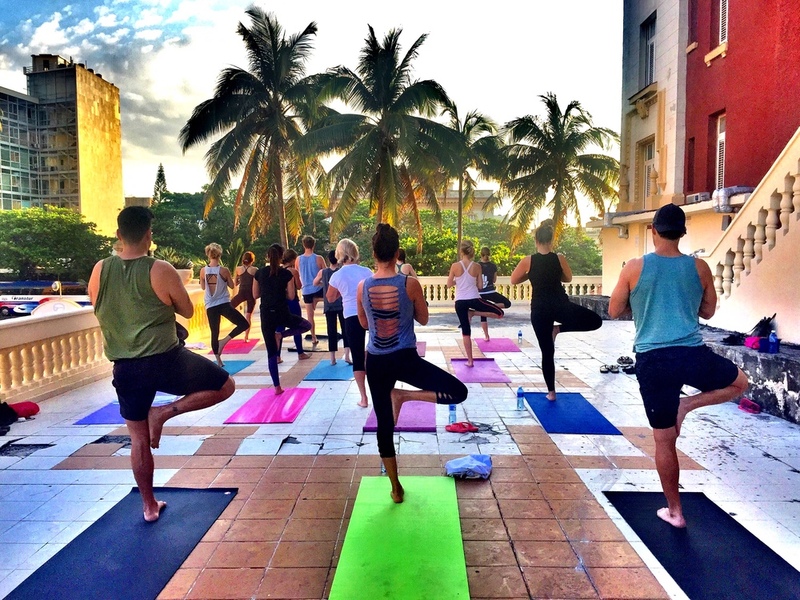 I reached out to the guys at Cultural Contrast who do these trips all the time, and with their help, our incredible Cuba yoga adventure was born. And the yoga? We practiced on a rooftop at Hotel Presidente on the first two mornings. A beautiful sunrise flow where we soaked up the vibe of Havana. In Viñales, we practiced overlooking the valley under a thatched roof and at this point, we persuaded our Cuban tour guide and the bus driver to join us for their first ever yoga class and they both loved it. Back in Havana, we practiced in the oceanfront palapa with Eduardo and we wrapped up the trip with a gorgeous sunrise session at the Hotel Nacional overlooking the malecon. And as we departed for the airport, we left our yoga mats with Eduardo so that he could give them to his yoga students in Cuba who didn't have access to mats. even yoga teachers need to have some fun! organic family lunch in viñales! So many stories, so many memories, I could write a novel about our trip. We just had great times as a group - we laughed hard, we sang loudly and we connected. Community travel is hands down the best way to experience culture. Everything is better together. A huge thank you to everyone who came with us and Jason from Cultural Contrast for making it all happen. I'm so grateful for the chance to experience Cuba while it's still raw. There were so few tourists around that it felt like we were alone on the island. This trip left indelible memories and I know we are going back, soon. In the meantime, come to Bali with us! A few spots left for this once-in-a-lifetime trip - July 24 - 30, 2016. Amazing yoga with me and Mike, surf lessons, garden-fresh, organic food, adventures, great friends, and tons of new memories to be created. And if you want to find out when we're going back to Cuba, get on my mailing list below... Big love!